• my red tea is certified 100% pure organic to US FDA standards. • No additives or preservatives, just natural goodness. • Naturally caffeine free, GMO free and sustainably and ethically farmed. • Harvested by hand by farmers who care as much about our world and its inhabitants as we do. • Our farmers employ local workers to help increase employment in their immediate surroundings. • According to our South African farmers, one job is created for every 257 boxes of my red tea sold. • We have also carefully selected our packaging supplier who is a Forest Stewardship Council certified organization committed to provide packaging solutions that are environmentally responsible. In 2015, our packaging supplier recycled 399 tons of material. • Packaged in sealed cellophane packages and ensures freshness and quality. 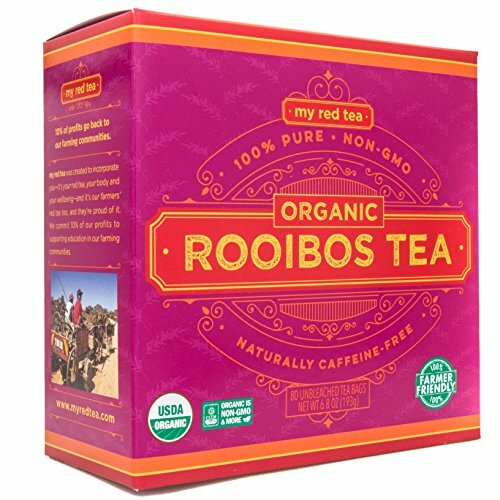 • Each box of my red tea organic Rooibos tea contains 4 individual cellophane packs each containing 20 unbleached tea bags - good for you and the environment. • No irrigation is used for Rooibos which means that less precious water resources are wasted. And the bees love the blossoms of the Rooibos plant too. • No calories, naturally low in tannins and high in minerals and antioxidants. • Uniquely South African, Rooibos tea is only be grown in the Cederberg, one small region of the Western Cape. If you have any questions about this product by My Red Tea, contact us by completing and submitting the form below. If you are looking for a specif part number, please include it with your message.